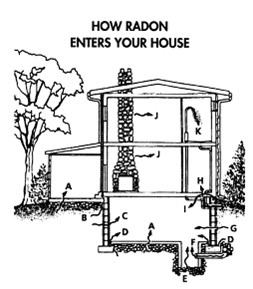 Radon is a naturally occurring, invisible, odorless gas that comes from deposits of uranium in soil, rock and water. Prolonged exposure to elevated levels of radon can be harmful when found in homes. District residents can obtain a free radon test kit by calling the radon hotline at (202) 535-2302 or by submitting request a free radon test kit. Radon is a radioactive decay product of radium, which is itself a decay product of uranium. Uranium and radium are both common elements in the soil. It is harmlessly dispersed in outdoor air, but when trapped in buildings, can be harmful, especially at elevated levels. Warm air rises. When this happens in your home, the rising air creates a vacuum in the lower areas of the house. Nature abhors a vacuum, so something must rush in to fill it. In the case of your home, air seeps in from the soil around and under the house, and some air is sucked in through openings (cracks, doors, windows) on the lower levels. Radon gas enters the same way air and other soil gases enter the home; through cracks in the foundation floor or walls, hollow-block walls, and openings around floor drains, pipes and sump pumps. The primary source of high levels of radon in homes is the surrounding soil. Radon has been found in elevated levels in homes in every state. The EPA estimates that as many as one in 15 homes across the US have elevated radon levels. Exposure to radon is the second leading cause of cancer in the United States. Radon can be inhaled into the lungs, where it undergoes radioactive decay. As it decays, radon releases tiny bursts of energy called alpha particles, which can harm sensitive lung tissue by damaging the DNA. This damaged DNA can lead to lung cancer. Request a free radon test kit. Testing your home for radon is as simple as opening a package, placing a radon detector in a designated area, and after the prescribed number of days, sealing the detector back in the package. Fixing a radon problem is usually just a matter of caulking cracks along basement foundations, sealing leaks around pipes, and taking other steps to prevent radon from entering the house through places where it is in contact with the ground. "I don't have a basement, I probably don't have a radon problem." Radon can seep in from soil anywhere around or under a home, regardless of whether your home has a basement, a crawl space, or is built slab-on-grade. The EPA and the Surgeon General recommend radon testing for all types of homes at or below the third floor. "I don't live in an area designated as a high radon zone, so my home won't have a problem." The EPA and the US Geologic Survey conducted a survey of radon potential across the United States. They broke the country down into three zones according to their potential for high indoor radon levels, with Zone I having the highest radon potential. It is true that homes in Zones I and 2 have a statistically high chance of having elevated levels of radon. However, the fact is that elevated levels of radon have been found in homes in all fifty states. The only way to know whether radon exists in elevated levels in your home is to test. "Two of my neighbors have tested their homes for radon and they don't have high levels, so I probably don't either." Radon levels can vary considerably from house to house, even on the same street. It is nearly impossible to predict the exact nature of geologic soil deposits and the extent to which soil gases will seep into and be retained by a specific house. The only way to know whether radon exists in elevated levels in your home, and to protect your family from radon, is to test. When choosing a contractor for radon mitigation or radon measurement, we highly recommend that you choose a contractor that is certified by the America Association of Radon Scientist and Technologists or the National Radon Safety Board. We strongly suggest that you ask for proof of certification before work begins.